I am very new to Ubuntu, and I'm having a problem that I don't know how to get it fixed. I even tried looking it up on the web for answers, but maybe I don't know the right terms to search for it. As a bit of reading taught me that Intellij IDEA is a keyboard-centric IDE. What it means, is that a use can work with it without having to touch the mouse. Also I manage find keymap setting. See how to change keyboard shortcuts? Note: You can always revert Ubuntu shortcuts back to its default state. Just refer to How can I restore default keyboard shortcuts?, in case if you're lost. I ran into this problem too, my solution, however, was different. IntelliJ has different Keymaps, which you can change according to your OS. You can change your IntelliJ Keymap from the settings. Just go to Settings -> Keymap and select your desired keymap from the dropdown. In my case, I chose "Default for GNOME" since I am using Ubuntu Gnome 16.04. I have created this script that disables all clashing shortcuts between Ubuntu (tested with 15.10) and IntelliJ (and probably more Jetbrains products). It disables them in Ubuntu. It also creates a backup file so that you can restore your previous settings. To not have some shortcuts disabled, comment them out in the KEYS array. See here for a way to disable Ubuntu shortcuts programmatically and only if windows of certain applications are active. While the script runs, Ubuntu shortcuts will always work except when IDEA et al. have focus. I have a collection of JetBrains-specific shortcuts here; input is appreciated. I am running Ubuntu 16.04 and what was happening is when I used these key strokes (ctrl-alt-left/right), the window was resizing and placing itself to the right or left of my screen. I tried disabling these key bindings in: Settings/Keyboard/Navigation, even though I don't have workspaces enabled. It still didn't prevent the behavior I was seeing. Fortunately, I opened up Compiz and stumbled across the Window Management/Grid plugin that was mapping these keys to place windows in a grid position. I disabled this plugin and now my IntelliJ key shortcuts work fine with ctrl-alt-left/right. For Ubuntu 16.04 go to settings > Keyboard and find the particular combination conflicting with your desired out click on it and update the combination to a new one. I use Xneur to switch mistyped text to other language. My system langauge is chaged by Ctrl + Shift what blocks Intellij hotkeys like Ctrl + Shift + F (Global search) and Ctrl + Shift + C (Comment). So left shift is ignored. One solution is to change language using Ctrl_L + Shift_L and use Ctrl_R + Shift_R for Intellij. But it is some kind of discomfort. The other solution is to use Xneur (sudo ap-get install xneur) to retype mistyped text in other language. You can disable any system langauge switching and assign it to xneur hotkeys (the same Ctrl+Shift). Xneur can be added to autostarted apps. Not the answer you're looking for? Browse other questions tagged shortcut-keys shortcuts intellij or ask your own question. How do I disable window move with alt + left mouse button in GNOME Shell? How can I restore default keyboard shortcuts? 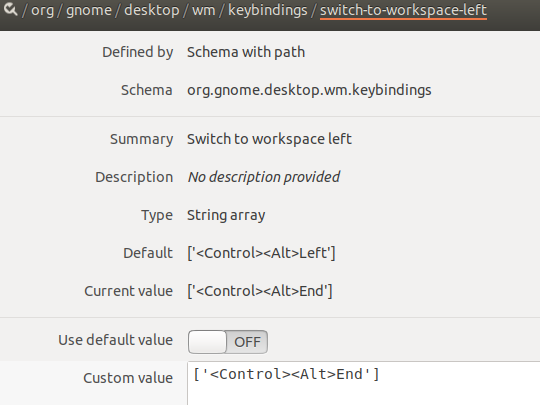 How to enumerate and monitor the assigned keyboard shortcuts at anytime in Ubuntu? How to disable all unity shortcut keys when using Blender?